So I'm coming from an iphone to this and i absolutely love it. however i'im concerned as after a minute or two of using the phone (over wifi when i wake up in the morning) I lose about 1-2%! in seconds to minutes. all straight from unplugging from the charger. why is this? I'm coming from an iphone where100% would usually last at least 20 minutes of use! How long have you had the M8? I have had the M8 since the day after it came out on Verizon in March. When I first got the phone, I enabled the setting that tells me what "percentage" of my battery is left. It freaked me out because I felt like my battery was dropping too rapidly based on the use. However, I think it is because the percentage meter is not the most accurate and it also creates some kind of mental insecurity with the user that breeds fear that the battery will not last long. I finally shut that setting off and just relied on looking at the little picture of the battery to tell me how much life I had left. For the past two months, I have never freaked out about the battery percentage and realized that my HTC One M8 lasts me from 6 a.m. when I wake up until 11 p.m. or so when I go to bed. I have not had it run out of battery on me yet. I use my HTC One M8 all throughout the day. I often finish writing motions on Google Docs while I am sitting in court for case managements. Why am I telling you this? Because you shouldn't sweat the battery life. You should be getting all day battery life out of your M8. I don't play games-- my usage is email, email, more email, drafting documents in Google Docs, reviewing discovery on Google Drive, Facebook, and a lot of text and Google Hangouts messaging. As a former iPhone user as well, I can tell you that the M8 has far superior battery life. Although, it is not exactly a fair comparison since the iPhone battery is a lot smaller. The iPhone does great for how small of a battery it has. 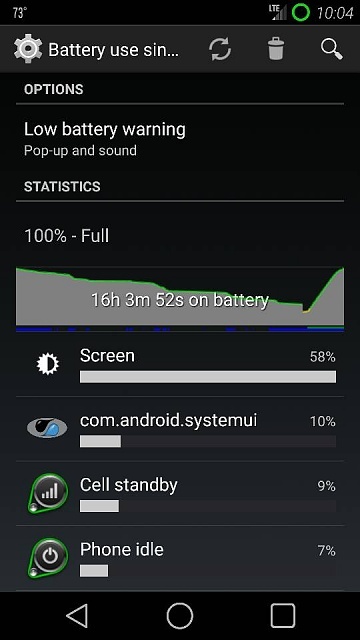 If you are not experiencing all day battery life with moderate usage, then you may have an issue. isdaako and crawfojj like this. i do get all day battery life lol but maybe i'm going crazy with that battery meter! same usage. email twitter messaging and a few videos here or there. i've given up games on my phone when i didn't really see the point in them. 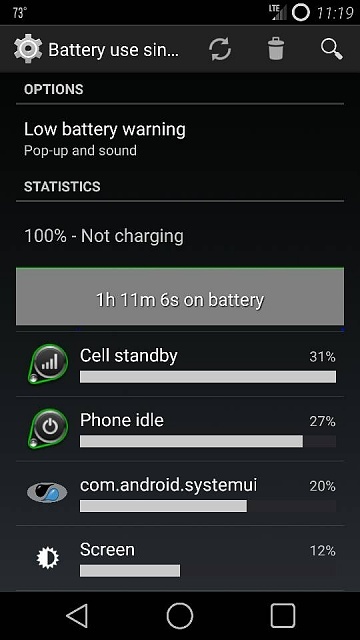 It took slightly over a week before my battery settled in. I can post a screenshot of yesterday's use in a moment. Also, something else to consider, the screen on any device is going to be the biggest consumer of battery power. Going from a 4" screen to a 4.8" screen is a significant jump for consumption. What I am going to say next is not a bash on Apple, but they may have users concerned about their battery in the future if the 4.7" and 5.5" (not sure if that one is right) screens are true. Just came from the iPhone community to Android as well. Comparatively, the M8 does have a better battery life than the iPhone but only because of the sheer size of it in comparison to the iPhone, but with the amount of resources/battery that the M8 demands, it balances out. But even with this slight balancing-out of battery demand, I still get extraordinary battery life out of the device. I've been using the battery percentage for a week now to see how it fairs with this week's usage without the battery percentage on to see if it's just a mind game of how the battery is "draining" or if it's normal and the percentage (like the iOS battery percentage) is inaccurate (but not as inaccurate as the iPhone). And @Golfdriver97, does LiquidSmooth demand as much resource as CM11? I ran CM11 for a few days and just overnight I was zapped almost 13% as opposed to the usual ~4% on stock Sense. This is factoring out the fact that Verizon's cellular strength is practically dog poo in my area, and all my notifications and setups are as identical as I can get them to be. *snip* What I am going to say next is not a bash on Apple, but they may have users concerned about their battery in the future if the 4.7" and 5.5" (not sure if that one is right) screens are true. It's in no way a bashing remark in my opinion. Because Apple consistently wants to keep the same general shape/design of their devices while making it thinner, it's impossible to implement a larger battery cell without jacking up the price pretty significantly as they're keeping their price ranges pretty much the same for the past 3 years or so since the 4S. This probably comes down to 2 things, how "honest" the battery meters are and that after 4 days your battery is still breaking in. Apple could be playing with the meter so it feels more like a topped off gas tank. Think about it, there's no way a battery can be at 100% after it's been used for 20 minutes. As for breaking in, I've only had my M8 a few days more than you and it's only stabilized in the past few days. Now I'm easily getting 15-16 hours. The screenshot I posted above is on Liquid. Sometimes, when you flash a new ROM, there is a little bit of battery drain, due to a new kernel, OS and media scanners are running to get used to the hardware, etc. Some ROMs (CM included) have the kernel default to Performance. This is one of the highest settings for the kernel possible. That may have been another answer to your battery drain. I unplugged my M8 right after posting my last screenshot. I will update the battery stats in a moment. woah. do not see a stat like that on my phone. mine would rain probably about 1% a minute. haven't really tested what its like but i could. furthermore i would love to use a custom rom like liquid smooth but would really prefer to keep the battery saving settings that are offered and the motion gestures. great as i'm too afraid of dropping the phone! also i keep trying to find any apps the keep the phone awake in the background. should i use wakelock for that?? Rooting is not for the faint of heart. By doing so you void your warranty. If you aren't careful, you can render your device useless. Am I trying to convince you to not do it or scare you? No. I am trying to fully inform you of the implied course of action. I would read as much as you can about root and how to do so with your device. The M8 needs to have the bootloader unlocked, and that will wipe the device from everything. If you are interested in rooting I can try to help you out as much as I can. Wakelock is a root only app. I read an article on the Battery University site that addressed this issue a while back, and I can't find it again now for the life of me. The article was discussing state of charge and measuring, and they mentioned how many cell phone gauges do tend to drop a few percentage points pretty quickly and then go to a more gradual decline during use. I think they attributed it to how the meter is manipulated, and the manufacturers are playing a bit of a mind game to make it look like the level is better than it is. Or something like that, anyway, to keep consumers from getting antsy and thinking the battery is going bad. What I was able to find in several other articles there while looking around is that Li-ion battery charge levels typically can't be accurately tested on a phone and have about a 10% error window (assuming a healthy battery). Basically, giving 1% charge levels is a guessing game. This is due to the phone usually being in use and the testing methods. For a true accurate reading, the battery should be in an open circuit at rest for at least 4 hours to stabilize if using voltage based testing. That's impossible on the M8, because it would require disconnecting and removing the battery. There's other testing methods, but they have their own drawbacks for accuracy. At the end of the day, I think it simply comes down to how well the battery lasts for your usage. Larger, more powerful phones need more oompf, and vice versa. As long as the battery's capacity is enough to get you through the day, be happy with it. That's my $0.01 (adjusted for inflation ). Another thing to consider is the OS does take into account your current usage. So if you are using a resource intensive app or game, and then leave it idle for a few hours, you might see a slight increase in remaining battery life. Took me seven days before the battery settled down, and it settled a tiny bit more after 9 days. I think Tasker can do that. would tasker however cause wakelocks and increase cpu usage than therefore kill more battery life? i have another issue, something was keeping my phone constantly awake for a ridiculous period. i was sleeping for about 6 hours and the phone dropped at least 20-30%. usually i charge when asleep but this time i decided to charge to 100 then let it be. now this standby time is ridiculous! Screen wasn't on. Phone was awake. Was Facebook messenger the culprit? HTC one m8 power problem? Can you get pictures from a broken HTC One?